Why does my child’s baby teeth need to be filled when they are just going to fall out anyways? This is a very legitimate question considering that, yes, baby teeth will eventually be replaced by some of the permanent teeth. It is understandable why some parents feel that it is unnecessary to “fix” them. Baby teeth are there for a reason. We call these first set of teeth “primary teeth” and they are important for eating, formation of speech and for saving the space that will eventually be occupied by the permanent teeth. The treatment options for repairing primary teeth depends largely upon when we expect the arrival of the permanent tooth. 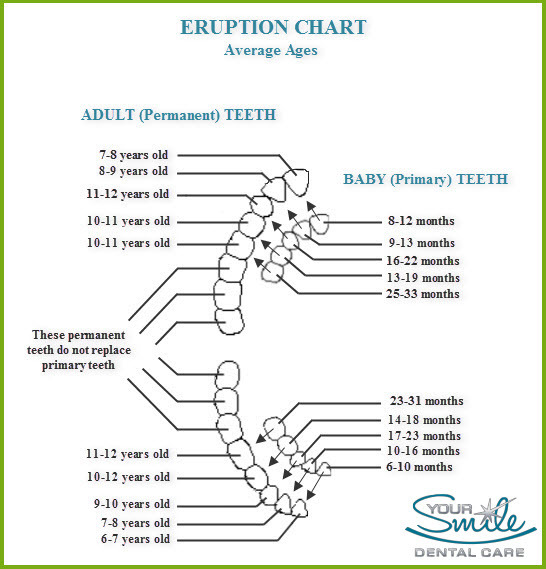 If you take a look at the chart below, there can be quite a few years before the permanent teeth emerge into the mouth. Primary teeth are smaller than permanent teeth. A cavity will get bigger, deeper and cause pain and eventually infection long before it will be replaced by it’s permanent successor. Can’t you just pull the tooth? Yes, we can when we are left with no alternative. If it becomes necessary to remove a tooth before it’s time we have to consider that the adjacent teeth will start to move into this new, vacant space. This smaller space makes it difficult for the permanent tooth to fit in properly. To prevent this, a dental appliance has to be made and cemented to these adjacent teeth to keep them from infringing upon this valuable space open. In Canada, 57% of children aged 6 – 11 have decayed, missing or filled teeth. This number increases for adolescents to 59%. Recent surveys indicate that toothaches are one of the leading causes of school absences and is the most common childhood disease worldwide. It is difficult for eating, sleeping or learning to take place when a child is in pain. This is why we are big on prevention at Your Smile Dental Care. Tooth decay is a disease that is wholly preventable. Ideally, your child’s first dental visit should be around the age of 2 when they have all of their baby teeth present, however, we invite you to learn as much as you can about this preventable disease long before your child’s first teeth arrive. We never discourage parents from bringing their children into our office when they are attending their own appointments. We believe that children who are familiar with our office and staff learn at an early age to develop positive attitudes about dentistry. Being able to enjoy themselves in the playroom while their parent is in treatment and leaving with a treasure from the toy box is an added bonus to their visits. If this sounds like the kind of dental practice that you would like for your family, give us a call today at (905) 5SMILES or come in for a tour. We will be happy to show you around and answer any questions you may have. For a sneak peek of our office visit our you tube video HERE. Meanwhile, we urge you to read the articles below to learn how to help your child have a cavity-free childhood.